Meyer’s first book, Black Radishes (2010), was about a family’s escape from the Nazis. This sequel may feel like a relief, at first. It would be possible to read the first half of this book and decide that it’s a story with no conflict. Or, rather, there’s conflict everywhere: poverty, war, and racism; it’s just that very little of the conflict happens to Gustave. His family has moved to America from France, and they have very little money. Gustave’s struggles are almost mundane. He can’t afford the long pants his friends are wearing, and—because of his limited English skills—other students try to trick him into saying rude things to a pretty girl. More often than not, he’s pretty happy. He’s made new friends and found a job as a delivery boy. The story is a series of small incidents. Some of the best scenes are tiny jokes about Chiquita bananas and candy bars. (Gustave has trouble making sense of the word “butterfingers.”) But those moments add up, and readers may gradually start to think of the characters as close friends. The later chapters of the book involve real danger. 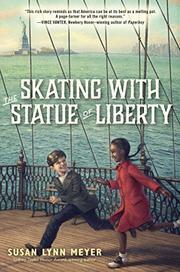 Gustave and his best friend, a black girl, are caught in the middle of a riot. And by then, the conflict might feel like it’s happening to people the readers have always known.